Okay, now I have today’s Friday Mashup challenge to share with you! Yay! It’s on time too! This challenge was an easy one for me and used up more of my every growing scrap bin. 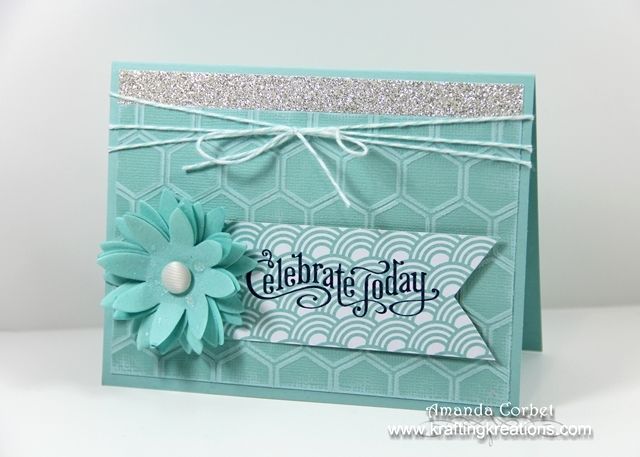 Create a project using "A Monochromatic Color Scheme". Create a project "using Baker's Twine". I was in a hurry so everything that I used for this card was already out on my table top or in my scrap bin. I love monochromatic cards! So much fun! So I went with my all-time favorite color Pool Party! You have no idea how relieved I was when I saw Stampin’ Up was keeping Pool Party. Back to the card... I started off with a piece of Pool Party (the best color EVER!) card stock cut at 5-1/2” x 8-1/2” and scored it at 4-1/4”. Next I adhered a piece of Pool Party Core’dinations that was 3-1/2” x 5-1/4” and already textured with the Honeycomb embossing folder and sanded. 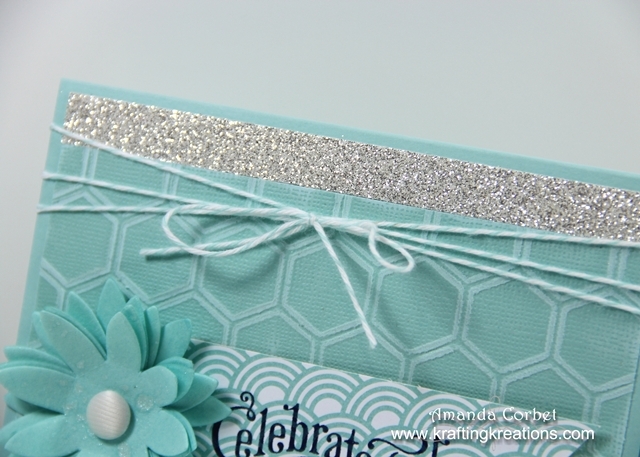 I cut a piece of Silver Glimmer Paper 1/2” x 5-1/4” and adhered it just above the textured card stock. I cut a scrap of Sycamore Street DSP down to 1-1/2” x 3-3/4”. 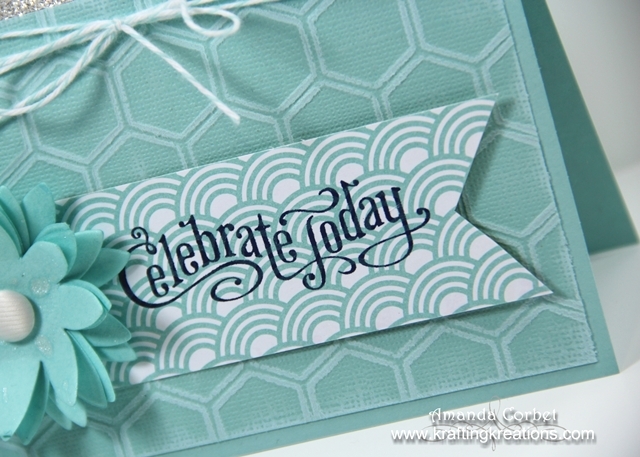 I stamped the greeting from Perfectly Penned onto the DSP in Midnight Muse ink and used Paper Snips to cut the right side in a dove-tail shape. I adhered this onto the card front with Anywhere Glue Stick on the left side and a Stampin’ Dimensional on the right side. Next I took some of the flowers from the Pop Up Posies Designer kit, stacked them up, pierced them with my Paper Piercing Tool and Stampin’ Pierce Mat and added a brad from the kit in the center of the flower. 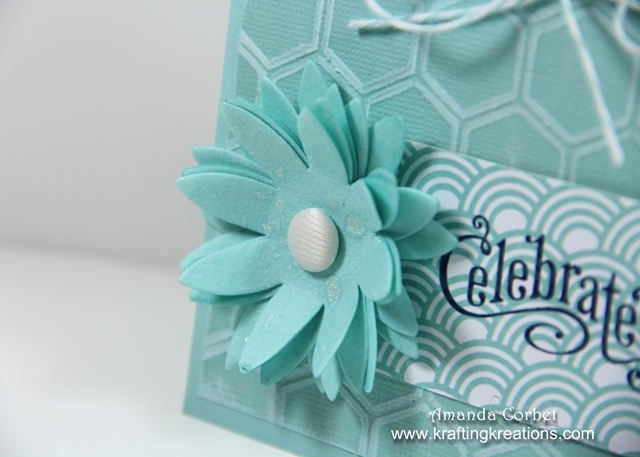 I fluffed up the petals then sprayed the flower with Vanilla Shimmer Smooch Sprtiz before adhering it onto the left side of the banner with Stampin’ Dimensionals. Finally I just wrapped a long piece of Pool Party Baker’s Twine around the card a few times and tied it into a bow. 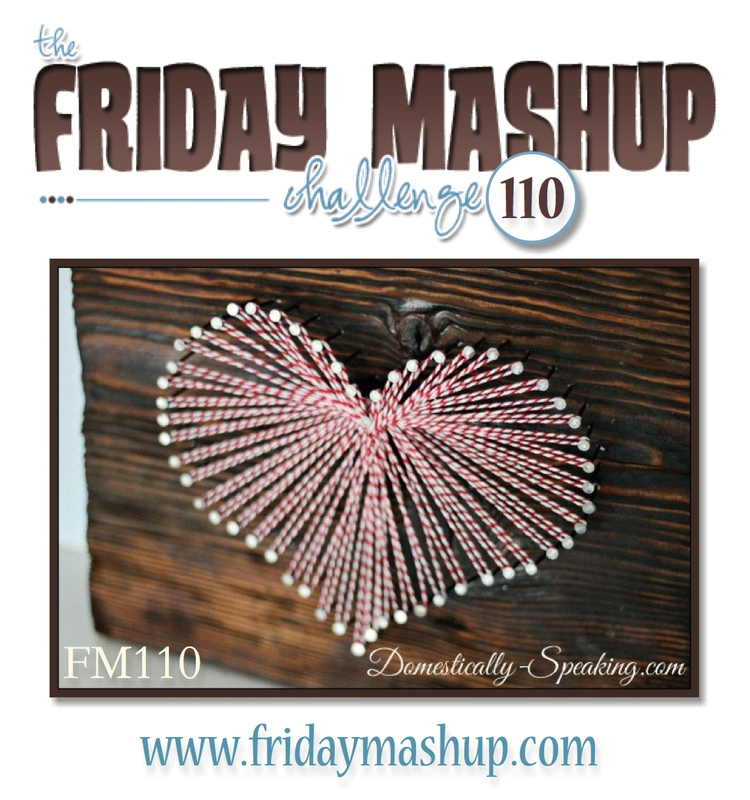 If you have a chance head on over to the Friday Mashup to see what the rest of the design team has created and maybe even play along!